When the grass starts growing in the spring, the demand for your lawn care business will grow along with it. You need to have a system in place that will enable your company and meet and exceed that rising demand. The solution? Smart Service, a lawn maintenance scheduling software that integrates with QuickBooks and allows you to sync all scheduling, billing, and client information into one easily accessible database. From your field workers mowing lawns at each job site to your office staff taking in customer service requests, all the way up to you as the owner, Smart Service gives your entire lawn care business a clear view on what tasks need completed. When the calls come flooding in for your lawn care service, you will want to put your dispatcher in the best position to book as much work as possible. Sorting through customer profiles, various paper records, databases, and searching through a physical calendar for open time slots can become a huge hassle. Lawn maintenance scheduling software for QuickBooks houses all of your customer and appointment information in one place. Dispatchers can pull up all the records they need while remaining on the phone with the potential client. This add-on makes multitasking easy and puts your dispatcher in the best position to set up every detail of the new job without putting the customer on hold. Your client won’t have to wait anxiously as their grass continues to thicken. Accurate and immediate responses will instill confidence and compel them to come back to you for return business. Since Smart Service syncs with QuickBooks, staying on top of client billing becomes a breeze. Lawn maintenance scheduling software allows you to link all your billing information in QuickBooks to the service jobs you book on the company calendar in Smart Service. Office workers can quickly locate their scheduled work orders and create invoices. This bill can then be sent to the customer via email or printed out for mailing. With your client under contract or set up for a recurring appointment, you can also set up recurring billing. Lawn care business software saves time by eliminating the need to manually send out invoices each time. Additionally, managing non-recurring bills becomes simple. After a few clicks to the client’s profile, you can view which service appointments have been paid for and which still need to be paid. This single database eliminates the need to match customer records or scramble through endless files of paperwork. Your office workers will endure less stress and gain more time to grow your business by scheduling more jobs. Keeping a single up-to-date database for your company not only allows your office to run more efficiently, it also allows for your field workers to maximize their profitability as well. 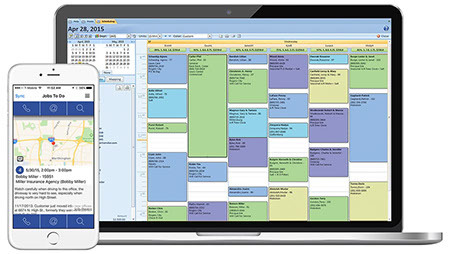 With lawn care scheduling software, you can add work orders to your company’s calendar in real-time. In the event of a cancellation, update your crew immediately via their mobile devices, eliminating wasted time and wasted gas. Fill schedule openings and send out updates instantly to your remote employees via the iFleet app. Your field workers can plan their day accordingly and eliminate the need to backtrack for supplies, paperwork, and equipment. This feature improves efficiency for field work and allows for more completed jobs every day. Forget your endless stacks of paperwork and go completely digital with our lawn care business software! Request a demo now to see how Smart Service can maximize the efficiency of your lawn care business! Tips for lawn care professionals!